Happy Tuesday! 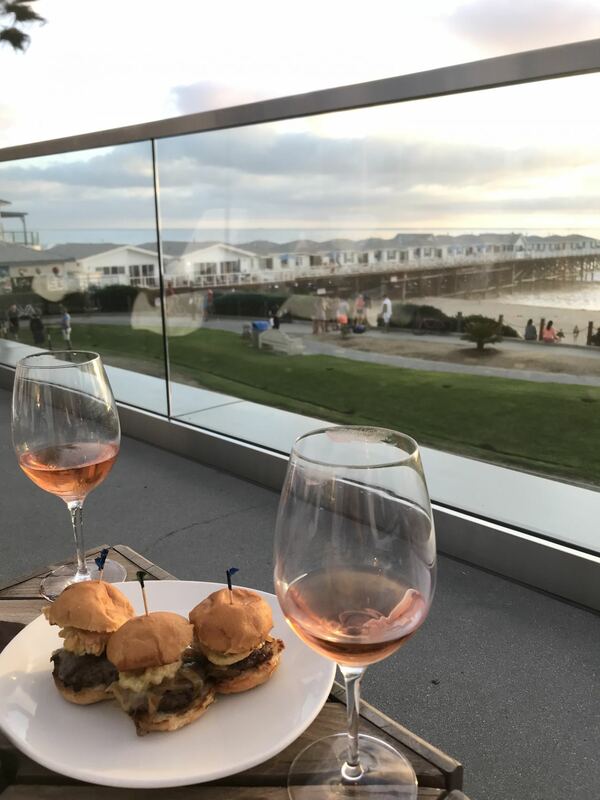 While doing two happy hour rounds last Friday, I thought to myself, I’ve probably tried the happy hours at all of my favorite (stylish of course) restaurants in San Diego and need to share my top faves with you! After shooting in Little Italy yesterday, I took my photographer friend to Ironside Fish and Oyster because she had never been there before and I’d been wanting to try their happy hour! They have fantastic happy hour deals like $1 oysters, $2 hand cut fries (can I get a hallelujah? ), $7 red and white wine specials and more amazing deals. And I love that their happy hour starts at 3 pm – which is an hour earlier than most restaurants! Click here for their happy hour menu. I didn’t even mention how cute and hip Ironside is! It’s one of the coolest and most creative decor restaurants I’ve ever been to! It’s a former warehouse turned into a ship concept, and I feel like if there was a Titanic mock-up with a restaurant inside, Ironside would be it! There are eye-catching, fun and chic details everywhere at this spot! From a piranha wall with hundreds of gold-plated piranhas to bronze mermaids and stacks of vintage suitcases that makes you feel like you’re actually in a ship, it’s all here. A giant octopus tentacle cradles a light bulb, or a silver octopus presenting a bowl full of Champagne, anyone? Yes, that exists at this place too. I’m obsessed with their copper bar and bar stools that you can actually swing out in a nautical way. Not only is the happy hour is on fleek at Ironside, but so are the photo ops. Can’t wait to go back! Probably next week – even when I’m by myself catching another white wine and french fries combo during their hour. Or maybe I’ll expand my horizon and try a few different things! After our happy hour sash at Ironside, I headed towards University Heights to meet a girlfriend at Madison. I haven’t been here in a few years probably. I’ve actually only been once for dinner, right after they opened. I guess I thought it was a little expensive, but if I knew they had a great happy hour menu, I’m sure I would have gone. Madison is one of the freshest, most chic restaurants in San Diego in my opinion and definitely makes my Instagrammable restaurants in San Diego list. No wonder why it was voted for San Diego’s Best Cocktails & Best Design. Definitely want to go back asap to try their other cocktails + happy hour dishes! Searsucker became a favorite of mine years ago and it’s one of the most up-scale, trendy and chic restaurants in San Diego. Great for people watching too 🙂 A lot of business people come after work and I remember doing the same thing some Friday nights after work when I was working 9-5. It’s definitely on the more expensive side of restaurants but it’s totally worth it, and their happy hour is a great excuse to check out Seersucker. I’ve always loved their food drinks, but I didn’t know they had a great happy hour menu until recently. $7 house wines, wells and infusions, $6 craft beers, $9 whiskey specialties and yummy discounted dishes like their famous Duck Fat Fries courtesy of their Executive Chef Tony Torres. This is a must try! Also love their charcuterie & cheese board, hummus plate, and fish tacos! I was invited to their Old-Fashioned Happy Hour event and got to try a few of their famous old-fashioneds like the pb&j old fashioned, smoked old fashioned and other mouth-watering cocktails like blackberry smash and jalaberry strawpeño. Click here for Searsucker’s happy hour menu. Also highly recommend their Sunday Brunch. Bottomless mimosas, amazing food, and an Instagrammable and modern decor with a classic touch is A+ in my book. I had a chance to try JRDN’s happy hour when I stayed at the Tower23 Hotel a few months back. Their happy hour doesn’t include food but they have amazing drink specials like $6 house red, white and rosé wine ( Can you tell I’m a rosé girl at heart?) + bubbles, $6 well cocktails, $6 hot or cold sake and $6 Sapporo drafts. I’m mostly interested in the rosé obviously but I want to go back soon for dinner to try more of their Japanese dishes and their happy hour sake deal. Click here for my full review of JRDN and my stay at the TOWER23 Hotel. Such a unique bar with 70’s vibe! I was amazed when I first stepped into Sycamore Den. It felt like I was in a cold cabin somewhere in the mountains of a rich, snowy village. Proud of this description 🙂 Sycamore Den screams retro cool and its unique design makes it super Instagrammable. There’s no shortage of chic and exciting details here like the big, glamorous fireplace, stone walls, arcade machines, oversized orange booths, dim-orange lighting and a little trinket collection of interesting cool figurines above the bar. If you’re like me and appreciate a cool and different atmosphere when you go out, Sycamore Den won’t disappoint. Their happy hours deals are $2 off cocktails, $7 glasses of wine and $1 off draft beers. I tried ‘The Ticket’, ‘Crime of Passion’, and a few more I can’t remember, but they were definitely all super delicious and beautifully presented. Love me a good, interesting cocktail name! Hands down one of the cocktail spots in San Diego! They don’t have food but they offer popcorn snacks and you can always order food from the Japanese restaurant next door which I’ve done before, and it was great. Have you been to any of these spots? 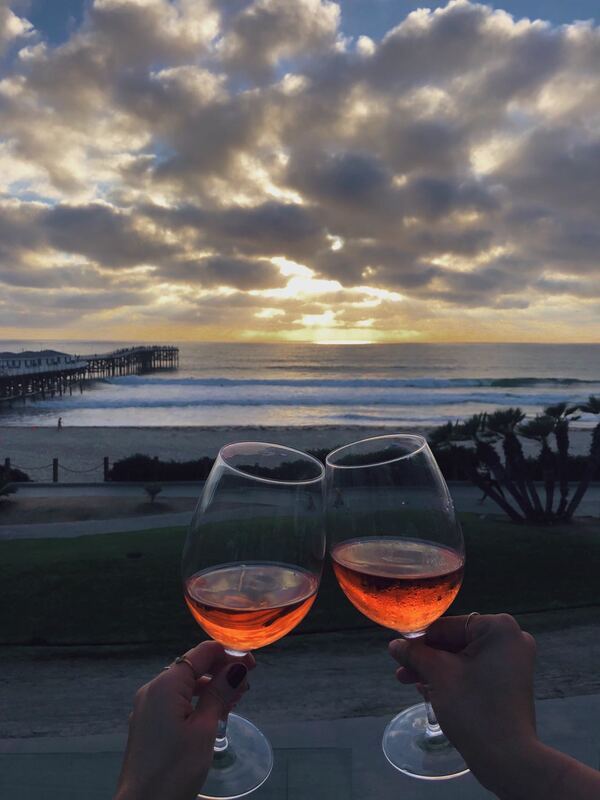 And what’s your fav happy Hour in San Diego? Leave your answer in the comments!